Mark – a follower of Peter and so an "apostolic man,"
John – a disciple of Jesus and the youngest of his Twelve Apostles. They are called evangelists, a word meaning "people who proclaim good news," because their books aim to tell the "good news" ("gospel") of Jesus. In iconography, the evangelists often appear in Evangelist portraits derived from classical tradition, and are also frequently represented by the symbols which originate from the four "living creatures" that draw the throne-chariot of God, the Merkabah, in the vision in the Book of Ezekiel (Chapter 1) reflected in the Book of Revelation (4.6-9ff), though neither source links the creatures to the Evangelists. Images normally, but not invariably, appear with wings like angels. When the symbols of the Four Evangelists appear together, it is called a Tetramorph, and is common in the Romanesque art of Europe, in church frescoes or mural paintings, for instance. The meanings accruing to the symbols grew over centuries, with an early formulation by Jerome, and were fully expressed by Rabanus Maurus, who set out three layers of meaning for the beasts, as representing firstly the Evangelists, secondly the nature of Christ, and thirdly the virtues required of a Christian for salvation: These animals may have originally been seen as representing the highest forms of the various types of animals, i.e., man, the king of creation as the image of the creator; the lion as the king of beasts of prey (meat-eating); the ox as the king of domesticated animals (grass-eating) and the eagle as the king of the birds. Matthew the Evangelist, the author of the first gospel account, is symbolized by a winged man, or angel. Matthew's gospel starts with Joseph's genealogy from Abraham; it represents Jesus' Incarnation, and so Christ's human nature. This signifies that Christians should use their reason for salvation. Mark the Evangelist, the author of the second gospel account, is symbolized by a winged lion – a figure of courage and monarchy. The lion also represents Jesus' resurrection (because lions were believed to sleep with open eyes, a comparison with Christ in the tomb), and Christ as king. This signifies that Christians should be courageous on the path of salvation. Luke the Evangelist, the author of the third gospel account (and the Acts of the Apostles), is symbolized by a winged ox or bull – a figure of sacrifice, service and strength. Luke's account begins with the duties of Zechariah in the temple; it represents Jesus' sacrifice in His Passion and Crucifixion, as well as Christ being High priest (this also represents Mary's obedience). The ox signifies that Christians should be prepared to sacrifice themselves in following Christ. John the Evangelist, the author of the fourth gospel account, is symbolized by an eagle – a figure of the sky, and believed by Christian scholars to be able to look straight into the sun. John starts with an eternal overview of Jesus the Logos and goes on to describe many things with a "higher" christology than the other three (synoptic) gospels; it represents Jesus' Ascension, and Christ's divine nature. This symbolizes that Christians should look on eternity without flinching as they journey towards their goal of union with God. Each of the symbols is depicted with wings, following the biblical sources first in Ezekiel 1–2, and in Revelation. 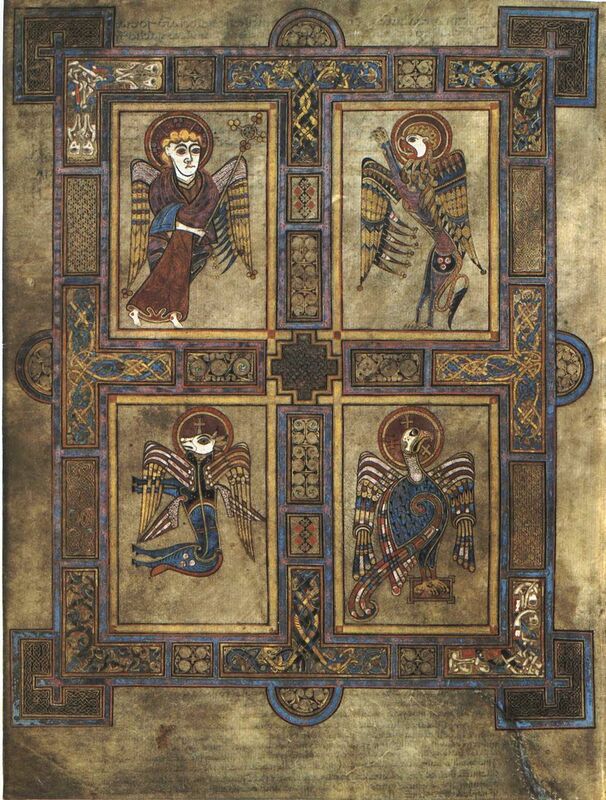 The symbols are shown with, or in place of, the Evangelists in early medieval Gospel Books, and are the usual accompaniment to Christ in Majesty when portrayed during the same period, reflecting the vision in Revelation. They were presented as one of the most common motifs found on church portals and apses, as well as many other locations. When surrounding Christ, the figure of the man usually appears at top left – above Christ's right hand, with the lion above Christ's left arm. Underneath the man is the ox and underneath the lion is the eagle. This both reflects the medieval idea of the order of "nobility" of nature of the beasts (man, lion, ox, eagle) and the text of Ezekiel 1:10. From the thirteenth century their use began to decline, as a new conception of Christ in Majesty, showing the wounds of the Passion, came into use. Sometimes in Evangelist portraits they appear to dictate to the writing evangelist. Matthew is often cited as the "first Gospel account," not only owing to its place in the canon, but also in view of the patristic witness to this effect. Most biblical scholars however, see the gospel account of Mark as having been written first (see Markan priority) and John's gospel account as having been written last. It has become customary to speak of "the Gospel of Matthew" ... "the Gospel of John", not least because it is shorter and rolls much more smoothly off the tongue; but it is worth noting that the ancient titles do not use the genitive of possession, but the preposition "according to", signifying that each evangelist sets forth the one "Gospel of God" according to his own capacity, but not in the sense of creating his own story. ^ Lincoln, Andrew (2005-11-25). Gospel According to St John: Black's New Testament Commentaries. ISBN 9781441188229. ^ France, R.T (2007-07-11). The Gospel of Matthew. p. 18. ISBN 9780802825018. ^ Tertullian, Adv. Marc. V.2. ^ a b "Jerome, Preface to Commentary on Matthew". The Fathers of the Church. 117. ^ a b Male, Emile (1913). L'Art religieux du XIIIe siècle en France [The Gothic Image: Religious Art in France of the Thirteenth Century] (3 ed.). London: Collins. pp. 35–7. ISBN 978-0064300322. Brent Pelham is a village and civil parish in the East Hertfordshire district, in the county of Hertfordshire, England, and situated approximately 5 miles (8 km) east of Buntingford. It is one of the three Pelhams, with Stocking Pelham and Furneux Pelham. It shares a parish council with Meesden. The parish church of St Mary's dates from the 14th century. It contains a black marble tomb slab of the 13th century, upon which the name of legendary local dragon-slayer Piers Shonks and a date of 1086 has been added. Symbols of the Four Evangelists - angel, eagle, lion, and bull - have been carved in relief around a dragon's mouth. The church is part of a benefice with Anstey, Hormead, Meesden and Wyddial.Near St Mary's church are ancient stocks which could accommodate up to three people. A derelict windmill survives in the village. There is a Royal Observer Corps observer post just outside the village, but it is now in a state of disrepair. It has an Orlit, which is rare for posts in this area. Dersingham is a village, civil parish and electoral ward in the English county of Norfolk. It is situated some 12 kilometres (7.5 mi) north of the town of King's Lynn and 70 km (43 mi) north-west of the city of Norwich, opening onto The Wash. The civil parish has an area of 14.5 km2 (5.6 sq mi) and in the 2001 census had a population of 4,502 in 2,110 households, the population increasing to 4,640 at the 2011 Census. For the purposes of local government, the parish falls within the district of King's Lynn and West Norfolk. Sandringham House, a favoured Royal residence of Her Majesty Queen Elizabeth II and several of her predecessors, lies just to the south of Dersingham in the parish of Sandringham. The Queen visited Dersingham Infant School to mark her Diamond Jubilee accession day on 6 February 2012.The Church of St Nicholas is a Grade I listed building. The wooden parish chest, dating from the middle of the 14th century, is carved elaborately with the symbols of the four Evangelists; on the lid, there is part of an inscription. The nearby Dersingham Bog National Nature Reserve, managed by Natural England (formerly English Nature), contains habitats ranging from marshland to heathland and woodland. Birds such as the redpoll, crossbill, long-eared owl, tree pipit, sparrowhawk and nightjar can be found there. Evangelist portraits are a specific type of miniature included in ancient and mediaeval illuminated manuscript Gospel Books, and later in Bibles and other books, as well as other media. 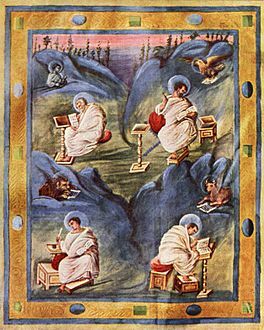 Each Gospel of the Four Evangelists, the books of Matthew, Mark, Luke, and John, may be prefaced by a portrait of the Evangelist, usually occupying a full page. Their symbols may be shown with them, or separately. Often they are the only figurative illumination in the manuscript. They are a common feature in larger Gospel Books from the earliest examples in the 6th century until the decline of that format for illustrated books in the High Middle Ages, by which time their conventions were being used for portraits of other authors. The gospels demonstrate the homelessness of Jesus lasting for the entirety of his public ministry. He left the economic security he had as an artisan and the reciprocity he had with his family and wandered Palestine depending on charity. Many of the people on whom he depended for charity were women. Because his ministry took place in the vicinity of his disciples' hometowns, it is likely that the group often slept at the homes of the disciples' family members.Of the Four Evangelists, Luke emphasizes Jesus' homelessness the most. Matthew 8:20 and Luke 9:59 both record a statement by Jesus in which he describes his homelessness by saying that "foxes have holes and the birds of the air have nests, but the son of man has nowhere to lay his head". The implication is that the scribe who has just offered to become a follower of Jesus should also expect the same. Theologian John Gill noted a parallel between this saying and the Jews' expectation of the Messiah: "if he (the Messiah) should come, 'there's no place in which he can sit down'.Sophiologists interpreted Jesus' homelessness as the homelessness of Sophia. New Monastic writer Shane Claiborne refers to Jesus as "the homeless rabbi". Catholic theologian Rosemary Radford Ruether discusses Jesus' homelessness in relation to the concept of kenosis, the voluntary renunciation of power in order to submit to the will of God. In a book length study on the Gospel of Matthew, Robert J. Myles has argued that the homelessness of Jesus is often romanticized in biblical interpretation in a way that obscures the destitution and lack of agency that would have likely accompanied the situation.Canadian sculptor Tim Schmalz created Jesus the Homeless, a bronze sculpture of Jesus lying on a park bench covered in a blanket with his wounded feet protruding. The New Testament mentions Luke briefly a few times, and the Pauline Epistle to the Colossians refers to him as a physician (from Greek for 'one who heals'); thus he is thought to have been both a physician and a disciple of Paul. Since the early years of the faith, Christians have regarded him as a saint. He is believed to have been a martyr, reportedly having been hanged from an olive tree, though some believe otherwise.The Roman Catholic Church and other major denominations venerate him as Saint Luke the Evangelist and as a patron saint of artists, physicians, bachelors, surgeons, students and butchers; his feast day takes place on 18 October. Mark the Evangelist (Latin: Mārcus; Greek: Μᾶρκος, translit. Mârkos; Coptic: Ⲙⲁⲣⲕⲟⲥ Markos; Hebrew: מרקוס‎ Marqos; Arabic: مَرْقُس‎ Marqus; Amharic: ማርቆስ Marḳos; Berber languages: ⵎⴰⵔⵇⵓⵙ) is the traditionally ascribed author of the Gospel of Mark. Mark is said to have founded the Church of Alexandria, one of the most important episcopal sees of early Christianity. His feast day is celebrated on April 25, and his symbol is the winged lion. "O Mensch, bewein dein Sünde groß" (O man, bewail thy sins so great) is a Lutheran Passion hymn with a text written by Sebald Heyden in 1530. The author reflects the Passion, based on the Four Evangelists, originally in 23 stanzas. The lyrics were written for an older melody, "Es sind doch selig alle, die im rechten Glauben wandeln" (Zahn No. 8303). The first and last stanzas have appeared in 11 hymnals. Catherine Winkworth translated it as "O man, thy grievous sin bemoan". The hymn has been used in Passion music and is known in Bach's setting as a chorale fantasia closing Part I of his St Matthew Passion. Christianity has used symbolism from its very beginnings. Each saint has a story and a reason why they led an exemplary life. Symbols have been used to tell these stories throughout the history of the Church. A number of Christian saints are traditionally represented by a symbol or iconic motif associated with their life, termed an attribute or emblem, in order to identify them. The study of these forms part of iconography in art history. They were particularly used so that the illiterate could recognize a scene, and to give each of the Saints something of a personality in art. They are often carried in the hand by the Saint. Attributes often vary with either time or geography, especially between Eastern Christianity and the West. Orthodox images more often contained inscriptions with the names of saints, so the Eastern repertoire of attributes is generally smaller than the Western. Many of the most prominent saints, like Saint Peter and Saint John the Evangelist can also be recognised by a distinctive facial type – as can Christ. In the case of later saints their actual historical appearance can also be used; Saint Bernardino of Siena (1380–1444) is one of the earliest whose distinctive appearance was well-known from early prints and is nearly always used by artists. Some attributes are general, such as the palm frond carried by martyrs. The use of a symbol in a work of art depicting a Saint reminds people who is being shown and of their story. The following is a list of some of these attributes. The church Santo Stefano di Sessano is all that remains of the village of Sessano, located on the rocky foreland to the east of the village of Chiaverano, which may have been abandoned after a landslide. The 11th-century building has the characteristic features of the Romanesque churches in the area, such as the belltower in the center of the façade. The actual building has a single nave three bays and an end apse. The sacristy was added to the apse during the Baroque period. The outside the apse is decorated with four lesene and twelve niches. Inside it preserves precious frescoes from the 11th century, featuring Christ and the four Evangelists, with 14 figures below representig the Apostles and saints. St Ib's Church (Sankt Ibs kirke or Ibsker), 3 km south-west of Svaneke on the Danish island of Bornholm, is a fine 12th century Romanesque building. The altarpiece was painted by Christoffer Wilhelm Eckersberg in 1846. The Renaissance pulpit (ca 1600) was decorated by Paul Høm in 1964 with ceramics of the four evangelists. St. John is a painting by the Dutch Golden Age painter Frans Hals, painted in 1625 and now in the Getty Museum, Los Angeles. Archaeological evidence exists showing that early man divided the four quarters of the horizon, or space, later a place of sacrifice, such as a temple, and attributed characteristics and spiritual qualities to each quarter. Alternatively the composite elements were carved into mythic creatures such as the ancient Egyptian, Greek and Babylonian sphinxes of antiquity depicting bull-like bodies with birds-wings, lion’s paws and human faces. Such composite creatures are found in many mythologies. In Christian art, the tetramorph is the union of the symbols of the Four Evangelists, derived from the four living creatures in the Book of Ezekiel, into a single figure or, more commonly, a group of four figures. Each of the four Evangelists is associated with one of the living creatures, usually shown with wings. The most common association, but not the original or only, is: Matthew the man, Mark the lion, Luke the ox, and John the eagle. In Christian art and iconography, Evangelist portraits are often accompanied by tetramorphs, or the symbols alone used to represent them. Evangelist portraits that depict them in their human forms are often accompanied by their symbolic creatures, and Christ in Majesty is often shown surrounded by the four symbols. The word comes from the Greek for "four forms" or "shapes". In English usage each symbol may be described as a tetramorph in the singular, and a group as "the tetramorphs", but usually only in contexts where all four are included. The tetramorphs were especially common in Early Medieval art, above all in illuminated Gospel books, but remain common in religious art to the present day. The Four Evangelists (French: Les quatre évangélistes) is an oil on canvas painting by the Flemish Baroque artist Jacob Jordaens, completed in 1625. The painting is 133 by 118 centimeters. and is in the Musée du Louvre, Paris, France. The World (XXI) is the 21st trump or Major Arcana card in the tarot deck. It the final card of the Major Arcana or tarot trump sequence.